The aptly named HEIR BORN was hidden away for much of his life without being shown or bred. HEIR BORN is the ONLY son of World Champion Stallion IMPERIAL IMDAL+ out of a daughter of Reserve National Champion Stallion SHAIKH AL BADI. As stated by judge Jim Panek, “Years earlier I was on the panel of judges at the Salon du Cheval in Paris who named IMPERIAL IMDAL+ World Champion Stallion. The likeness of HEIR BORN to his world famous sire is quite remarkable. 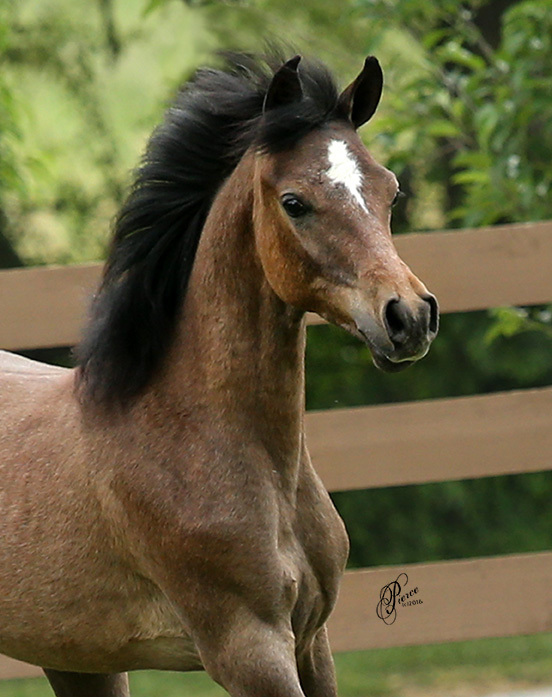 HEIR BORN-what a treasure as a breeding stallion!” HEIR BORN has his sire’s true desert type, with substance, good bone, wedge-shaped head with large eyes, plume tail carriage and exciting charisma. PICTURED LEFT: Warith Al Asante, Heir Born's first foal at Asante Arabians - a 2014 Colt! PICTURED LEFT: Badeel Al Asante (Heir Born x Saffire MA) - a 2015 Colt!